Edwards LIfesciences has a heritage of partnering with clinicians to bring advancements in patient care to the market. That heritage is at the core of the Acumen Hypotension Prediction Index software. Developed in partnership with clinicians across the world and the first in a new category of products, Acumen Hypotension Prediction Index software offers the only predictive monitoring parameter for hypotension that is available in the United States. 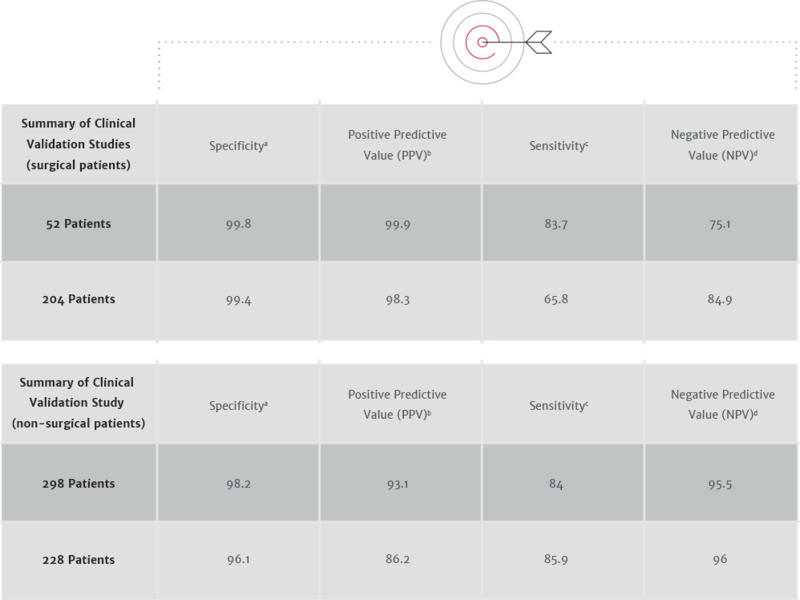 This first-of-its-kind predictive decision support software detects the likelihood of a hypotensive event before the event occurs, and provides you with insights to understand the root cause and inform a potential course of action for your patient. Know more about the risks of hypotension. Part of the Acumen decision support suite, the Acumen Hypotension Prediction Index software is unlocked with the FloTrac IQ sensor. The proprietary algorithm — developed using data from almost 59,000 hypotensive events and over 144,000 non-hypotensive events — coupled with machine learning techniques detects potential hypotensive trending of a patient’s mean arterial pressure (MAP). The HPI parameter value is updated every 20 seconds, providing continuous predictive insights into developing hypotensive events. 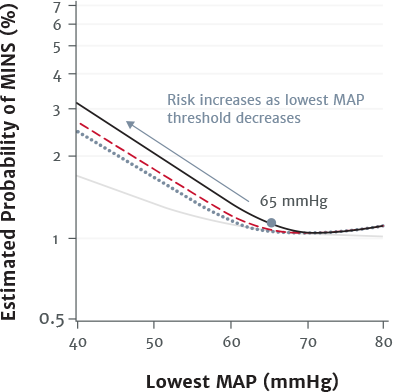 The higher the value of the HPI parameter, the greater the likelihood a hypotensive event will occur. The full table of Results of Clinical Validation studies may be found in Table 16-17 in the Operator's Manual. Sensitivity: ratio of true positives to total number of events (positives) with positive defined as data point that is at most 5 minutes prior to a hypotensive event. The HPI high alert popup alerts you when your patient is trending toward or experiencing a hypotensive event. 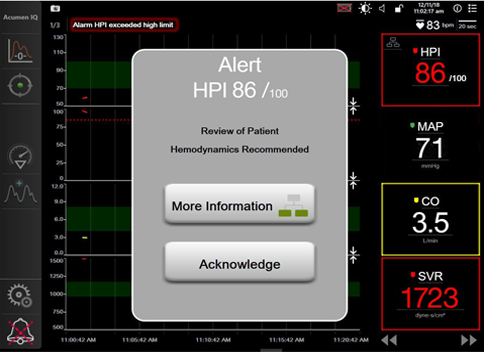 If the HPI parameter value exceeds 85 for two consecutive 20-second updates or reaches 100 at any time, the HPI high alert popup window will appear, prompting you to review the patient hemodynamics using the HPI secondary screen. If your patient is trending toward a hypotensive event, or is experiencing a hypotensive event, you may want to investigate the root cause in order to proactively inform a potential course of action. 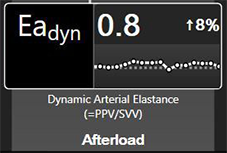 The advanced hemodynamic pressure and flow parameters provided on the HPI secondary screen allow you an opportunity to investigate and identify the root cause of potentially developing hypotensive events. 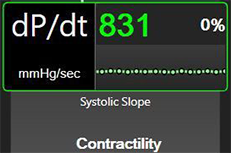 The HPI secondary screen is accessed through the HPI high alert popup, by touching the HPI Information Bar when enabled, by pressing the button on the HPI Key Parameter, or at any time through the Clinical Actions menu on the monitor. 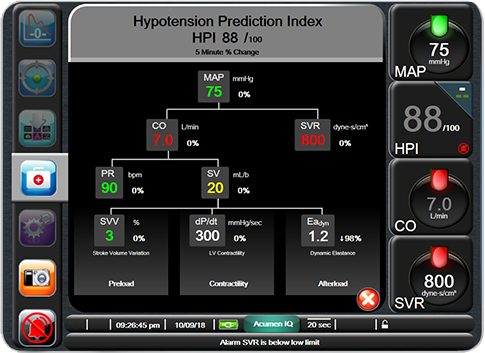 A clinically essential element of the Hypotension Prediction Index software, the HPI secondary screen displays consolidated values for patient parameters of MAP, CO, SVR, PR, SV, and SVV as well as two additional indicators of contractility and afterload to provide a complete hemodynamic profile of the patient. The advanced hemodynamic parameters on the secondary screen are arranged visually by preload, contractility, and afterload. Using these advanced hemodynamic parameters can provide you potential insights into the cause of a hypotensive event. The percent difference between minimum and maximum SV during a respiratory cycle. SVV serves as an accurate marker of position status on the Frank-Starling curve. A sensitive measure of changes in the contractility of the left ventricle. 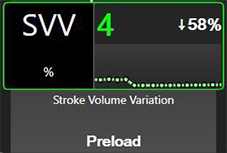 The ratio of pulse pressure variation to stroke volume variation (PPV/SVV). Acumen Hypotension Prediction Index software is the first predictive technology that provides you with information regarding the likelihood of a patient trending toward a hypotensive event* and assists you in understanding the root cause of deteriorating cardiovascular stability. The FloTrac IQ sensor — part of the FloTrac family of hemodynamic sensors — unlocks the Hypotension Prediction Index software. The minimally-invasive FloTrac IQ sensor connects to any existing radial arterial line. The FloTrac IQ system automatically updates advanced parameters every 20 seconds, reflecting rapid physiological changes in moderate-to high-risk surgery. 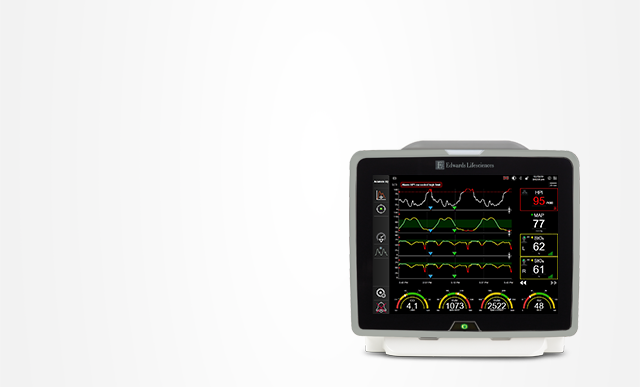 Advanced hemodynamic parameters provided by the FloTrac IQ sensor offer you continuous insight into your patient’s hemodynamic status. Salmasi, V., Maheshwari, K., Yang, G., Mascha, E.J., Singh, A., Sessler, D.I., & Kurz, A. (2017). Relationship between intraoperative hypotension, defined by either reduction from baseline or absolute thresholds, and acute kidney injury and myocardial injury. Anesthesiology, 126(1), 47-65. Sun, L.Y., Wijeysundera, D.N., Tait, G.A., & Beattie, W.S. (2015). Association of Intraoperative Hypotension with Acute Kidney Injury after Elective non-cardiac Surgery. Anesthesiology, 123(3), 515-523. Walsh, M., Devereaux, P.J., Garg, A.X., Kurz, A., Turan, A., Rodseth, R.N., Cywinski, J., Thabane, L., & Sessler, D.I. (2013). Relationship between Intraoperative Mean Arterial Pressure and Clinical Outcomes after non-cardiac Surgery. Anesthesiology, 119(3), 507-515. Devereaux and Sessler, Cardiac complications in patients undergoing major non-cardiac surgery, N Engl J Med, 2015, 373(23):2258-2269. Sellers, D., Srinivas, C., Djaiani, G. (2018). Cardiovascular complications after non-cardiac surgery. Anaesthesia, 73 (Suppl. 1), 34 - 42.
van Waes, J., Nathoe, H., Graaff, J., Kemperman, H., de Borst, G., Peelen, L., van Klei, W. (2013). 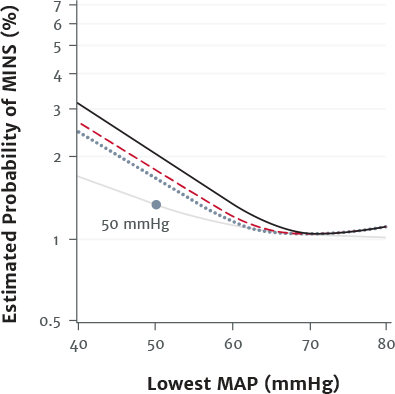 Myocardial Injury After Noncardiac Surgery and its Association With Short-Term Mortality. Circulation, 127, 2264 - 2271.